Our departure day finally came for our Israel Tour! Despite delayed flights both into JFK Airport (NY) and to Tel Aviv, we finally landed at the Ben Gurion Airport in Israel at 5:30 p.m. (Israeli time, 7 hour difference from EST). The night flight was for the most part very smooth. After going through passport control and getting our luggage, we met our guide, Shlomo, and our driver, “Bambi.” We drove to Jaffa (Joppa) for a quick walk around the old part of the town before heading to our hotel in Bat Yam. Upon arriving, we checked in the hotel located right on the Med Sea coastline, enjoyed dinner, and had a brief “orientation” meeting. It was a long day of travel, but we are thrilled to be here in the land of the Bible! We look forward to our first full day tomorrow. Our day started off well. Following breakfast, we departed the hotel shortly after 7:30 today. Greeted by sun and comfortable temperatures (low 60s by late morning), our first stop was Gezer, an Old Testament city located in the Aijalon Valley, one of the five valleys of the Shephelah (lowlands) of Judah. This was a city fortified by King Solomon (1 Kings 9). We saw the Canaanite tower and gate structure, Solomon’s gate, and the Messebot– “standing stones” that used for cultic or memorial purposes. Next, we drove a few miles south to the Sorek Valley. Here we visited Beth Shemesh. This was the area where Samson grew up (in nearby Zorah, Judges 13-14). This was also where the Ark of the Covenant was returned to by the Philistines (1 Samuel 6), being placed on a cart pulled by cows. The third valley, the Elah Valley, is where Azekah is. We climbed to the top of the “tel” (ancient mound). Looking a few miles west, we could see Gath, the hometown of Goliath. Looking east we could see as far as Hebron in the Hill Country of Judah as well as the “battlefield” between David and Goliath in the “narrow” (Hebrew – gai) part of the Elah Valley below. We read from 1 Samuel 17. Following lunch, we visited Beit Guvrin, called Maresha in the Old Testament, the hometown of Micah the prophet. We visited a couple of the soft limetone caves. In the “bell cave” we enjoy a time of singing. We also read from Micah 1 and 5. To end the day we visited Lachish. This most southern city in the Sephelah was a city destroyed by Joshua in two days (Joshua 10). During the divided kingdom, it was a double-walled city, probably refortified by King Rehoboam (2 Chronicles 11). This city was attacked by Sennecherib and the Assyrians at the end of the 8thcentury BC, and later destroyed completely by the Babylonians in the early part of the 6thcentury. It was the two last standing cities (along with Azekah). We read from Jeremiah 34:7, and talked about the “Lachish Letter #4). We hiked up to the tel, through the inner gate, and to the palace of Rehoboam. From here we drove to Beersheba where we checked in, enjoyed dinner together, and a time of sharing and worship following dinner. A few enjoyed a brief walk around this “capital” of the Negev populated by 200,000 people. It was a great first full day of exploring OT cities from the past. Leaving Arad, we drove east to Hanokdim, a “Bedouin-like” tent facility. On the way, we stopped to see a spectacular panoramic view of the Wilderness of Judah, the Dead Sea, and the Moab mountains across in Jordan (they were actually had snow on the peaks….quite amazing!). Upon arriving at Hanokdim, the first thing we did was ride camels. We returned for dinner, and a time of listening to a Bedouin Arab share about his unique lifestyle. Before retiring, some also ventured out into the desert for a time of star-gazing and reflection/worship. Staying here was really a unique experience! We awoke to another sunny day. The sunrise over the Judean desert was wonderful! Following breakfast, we boarded the bus and drove just 6 miles to Masada. We climbed the Romans ramp in order to get to the top of this “fortress.” The visited one of the cisterns where Shlomo introduced the story of Masada. We also saw the southern palace, a few dwelling rooms, the synagogue, and the bathhouse. A number of the group walked down the “snake path” while others took the cable car to the bottom on the eastern side. Driving north from here bout 15 minutes, our next stop was Engedi. We read from 2 Chronicles 20 and 1 Samuel 24 (the story of David, Saul, and the cave). We hiked back to the 3rdwaterfalls as well. Continuing to drive north along the western shoreline of the Dead Sea, we arrived at our next site, Qumran. After eating lunch here, we visited the site. This is where the Essenes scrolled hundreds of Hebrew texts of Scripture as well as other sectarian teachings. We rejoiced in how God has preserved His Word here. We read from “Psalm 151” (written by David) and 2 Timothy 3:16. The northern shore of the Dead Sea was our next destination. About half in the group enjoyed “floating” in this 30%+ salt/mineral water. We drove to the Al Mog kibbutz (seeing some camels and even a jackal on the way) where we would stay for the night. We enjoyed dinner together before retiring for the night. Today would be a cooler day with a few showers in the air. It actually rained during the night here in Jericho, something that doesn’t happen very often. After breakfast and checking out of our “kibbutz-hotel” here at Al Mog, our first stop as the Old Testament site of Jericho. We first viewed the site from the 5thfloor of the visitor center. From here we could see east across the Jordan (the stories of Joshua’s crossing (Josh 2), Elijah’s ascension/Elisha’s ministry (2 Kings 1 & 2), and Jesus’ baptism (John 1). From here we also could see “New Testament” Jericho, the home of Bartimeus and Zacheas (Mark 10, Luke 19). It as also here where King Herod died. 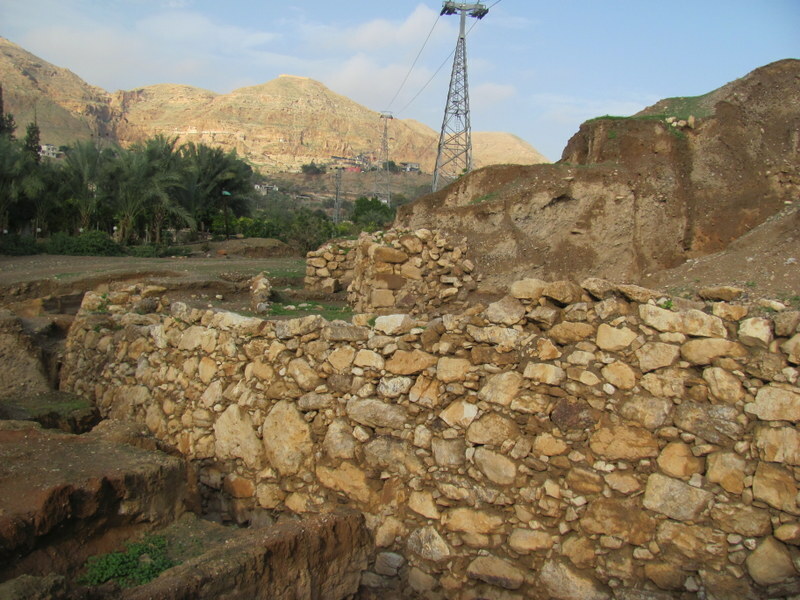 At the OT site itself, we saw the oldest tower in Israel (part of the earliest civilization here), as well as the “revetment/retaining” walls that supported the mud-brick walls that came “tumblin’ down.” We read from Joshua 6. Also new here at Jericho is a fantastic replica of the “Medeba Map” from Jordan. Next, we drove through to a place where we overlooked the “Wadi Qelt,” part of the Judean Wilderness. Here we read from Isaiah 40 and listened to a portion of Handel’s Messiah called “Comfort Ye My People.” Shlomo also sang Psalm 23 in Hebrew. From here we uniquely drove through the West Bank, passing Pareth (where Jeremiah hid the belt in the rock, Jeremiah 13:4), Michmash (the place of battle between Jonathan and the Philistines, 1 Samuel 13-14), and Bethel (where Abraham built an altar, Genesis 12) en route to Shiloh. Here, we visited the site where for 369 years the Tabernacle once stood. We watched a video presentation of the stories of Samuel, Eli, the Ark of the Covenant, and the importance of the Tabernacle. We read from I Samuel 4. Leaving Shiloh, we took some side roads through the beautiful mountains of Samaria. While we could not visit Mt. Gerizim and Mt. Ebal, we still enjoyed the scenery. We drove through the hills before descending down to the Jordan Valley en route to Beth Shean. Beth Shean is one of the most impressive sites in Israel. It was where Saul’s body was hung (on its walls, I Samuel 31). We visited the Roman part of the city, seeing the bathhouse, the “Cardo” (main street), and the theater. Some of us climbed to the top of the OT tel, gaining a great view of the site and surrounding valleys. On our way to our hotel on the NW corner of the Sea of Galilee (Nof Ginosar), we made a brief stop at the Kinneret Cemetery. Here we heard the story of the famous “Rachel.” Upon arriving at our “kibbutz-hotel” we enjoyed dinner and another gathering on the shoreline of the lake. We stay here for the next three nights. We started the day at 7:30. Rain was predicted for today, but it did not rain at all. Following breakfast, we boarded the bus on for a day primarily in the Golan Heights. From our kibbutz on the NW corner of the Sea of Galilee, we drove to the NE corner for an overview of the city of Bethsaida. We read from Mark 8 and John 6. Ascending now into the Golan, our first stop was Gamla, a city contemporary with the time of Jesus. This was the “Masada of the north” as it was here that the First Revolt started in 66 AD against the Romans. Here, one of the seven synagogues that date to the time of Jesus can be seen. We read from Acts 5 where there is referenced by Gamaliel a certain “Judas” the Galilean who revolted back in 6 AD. From here we continued to the “capital” of the Golan, Katzrin (Qatzrin). Here we visited a Talmudic village. A wonderful reconstructed stone house is on display here. Inside, we read from Mark 2 and talked about Jesus’ s’mekah (authority) in forgiving the lame man lowered down to Jesus through the opening in the roof. Driving north and higher in elevation, our planned stop to Ben Tal (to overlook Syria) was not possible because of the dense fog caused by all the snow on the ground. We literally were forced to drive very slow, with visibility only about 30-40 feet. We drove through a few Druze villages to our lunch stop at Birkat Ram at the foot of Mt. Hermon. Following lunch we drove west to Caesarea Philippi, a very pagan city in the 1stcentury. It was in this region where Jesus asked the question of His disciples – “Who do you say I am?”We read from Matthew 16 and Matthew 17 about this exchange as well as about Christ’s transfiguration.The spring here (the Banias spring) is one of the three sources / tributaries of the Jordan River. Close by is the OT site of Dan. We began the visit of this archaeological site by walking through the nature preserve. This is another of the three sources of the Jordan River. We read from Psalm 42. We then saw the “high place” of Dan where Jeroboam set up a false temple. We read from Judges 18 and 2 Kings 12 about the “pattern of disobedience” displayed here. We also looked into Lebanon from here, saw a herd of gazelles, and the Middle Bronze mud-brick gate that dates close to the time of Abraham (Genesis 14:14). On our drive back along the Hulah Valley, we drove past Abel Beit Maacah, an OT site. We read from 2 Samuel 20 about Sheba’s revolt. We climbed the mountains of Naphtali for a view of Lebanon, but the thick clouds blocked any good view. We arrived back at Nof Ginnosar for dinner. A fun game of “Jeopardy” followed! Today was another great day, with the bonus of having the sun and wonderfully comfortable temperatures (mid 60s). We left the kibbutz after breakfast and within 5 minutes we were already had our first stop. We arrived at the trailhead for Mt. Arbel, a 800 foot cliff that overlooks the NW corner of the Sea of Galilee. About 14 of us hiked to the top (70 minutes) while the bus took others (who saw a bunch of gazelles along the way) around the backside where a shorter hike was required to get to the top. Although a bit hazy, the view was great! Descending by bus back to Tiberias, we then drove to Chorazim. We visited the miqve(ritual bath) here, many dwelling structures, and the synagogue. Although it dates to the 3rdcentury AD, it includes a “Moses seat” as mentioned in Matthew 23. Capernaum was the next stop. Located on the shoreline of the lake, we visited the 4-5thcentury AD synagogue here. We read from Mark 1 & 2, Luke 7, and John 6, all about events that took place here. It was here, once again, where Jesus’ exhibited s’mekah (authority) in his teachings and healings. About noon, we drove to Nof Ginnosar to see the “Jesus Boat,” a 1stcentury AD ancient boat discovered in 1986. Following lunch here, we bordered our own private boat for a short excursion on the lake. We enjoyed a time of worship, reflection, and quietness together. We also were privilege to see the boxes of pottery from the dig at Bethsaida in the basement of the museum. We saw about 2 dozen “restored” pots and many boxes of pottery fragments. Nearby was Magdala. One of seven 1stcentury AD synagogues is here. This one was rather small and modest. Although not specifically mentioned in the Gospels, Jesus must have taught in this place! Mary “Magdalene” was from this city. Our last stop was the Mt. of Beatitudes. We listened to the reading of Matthew 5 in both Hebrew and English. We enjoyed some quiet reflection as well as we considered the historic facts of the Bible and the teaching and miracles of Jesus. With the sun setting, we all walked down to the shoreline of the lake, a 25 minute hike through the newly-planted fields. We returned to the kibbutz for dinner and a relaxing free night. It’s been a great two full days up in the Galilee/Golan regions. Today was a sunny and mild day, with temperatures again in the 60s. Saying goodbye to the Galilee, we checked out of our kibbutz and headed to the Lower Galilee and the site of Sepporis (“Zippori”). This was a large city dating to Jesus’ day and only 4-5 miles from Nazareth. We saw the Roman city, the villa, theater, and the famous “Mona Lisa of the Galilee” mosaic. Nearby is Jesus’ hometown of Nazareth. We ascended the “precipice” (Luke 4) and enjoyed the view of the Jezreel Valley below. Although it was hazy, we saw Mt. Tabor (Judges 4 & 5), and the Hill of Moreh (Judges 6 & 7). We enjoyed a time of worship as well, reflecting on John 1. We left this side of the Jezreel Valley and drove across to Megiddo on the other side. We climbed the “tel” and saw a few ancient gate structures, more stables and storehouses, an early Canaanite altar, and a grain silo. We read from Rev. 16 about how God has the final word. We then climbed down 180 steps into the water system, ascending 80 steps back up on the other side. From here we drove to Mt Carmel and Muhraqa. Following lunch, we visited the Carmelite chapel overlooking the Jezreel Valley from the west. We read from 1 Kings 18 and enjoyed a time of accapella singing. Our last stop of the day was Caesarea, a city built by Herod the Great in 18 BC, located on the coastline of the Sharon Plain. We visited the theater, palace, hippodrome, and harbor area. We even saw some “wedding pictures” taking place. At the aqueduct, the sunset over the Med Sea was spectacular. We drove to Jerusalem from here, arriving in time for dinner. An optional walk followed to the Old City and the Western Wall. It’s great to be in Jerusalem! Today was our first day in Jerusalem! With the sun shining on our east, our first view of the Old City of Jerusalem was spectacular! Driving from our hotel located across from the Hinnom Valley, we drove to the top of the Mt. of Olives. Looking west is the Temple Mount and the Old City. We walked down to Dominus Flavet, a church about half way down the slope. Here we read from Luke 19 (Palm Sunday) and Zechariah 14 (a prophecy about the nations gathering here one day). Near the Kidron Valley below is the Garden of Gethsamane. We paused to reflect upon Christ’s agony here (Matthew 25). From here we walked into the Old City through the Lion’s (or Stephen’s) Gate. We stopped at St. Anne’s and enjoyed singing in this crusader church. We also read John 5 about the Pools of Bethesda also located here. Soon the Via Dolorosa begins. We walked to the Church of the Holy Sepulcher an area of NT Jerusalem where Jesus may have been crucified and buried. Walking out of the Old City through the Jaffa Gate, we re-boarded our bus and drove southeast to Herodium, one of King Herod’s palace-fortresses. Following another “falafel” lunch here, we climbed the site. From the top we can see Bethlehem and Tekoa (the home of Amos). Before descending down through the cistern system, we got a “sneak peak” of the amazing and most recent excavations of the palace area. Here we saw original frescos and a series of monumental arches. Next we drove into Bethlehem, visiting first the Shepherds’ Fields (where we sang carols in a cave and chapel) and then the Church of Nativity (where we saw the traditional birthplace of Jesus). We ended the day at an olive wood shop. We drove back to the hotel, enjoying a free night. It was another great day! It was a sunny and even warmer day today, with highs in the mid 60s. We left the hotel again at 7:30. Our first stop as the Western Wall. Entering the “Kotel” (Western Wall plaza), we first visited the “rabbinical tunnel” (as it is called) that runs parallel to this western retaining wall of the Temple. It was amazing to see how large the Herodian stones are. They were placed with precision, a project started by Herod in 20 BC. We exited the tunnel and returned to the Western Wall, the most holy place for Jews today. In the afternoon, we drove to west Jerusalem. Our first stop as Yad Vashem, Israel’s Holocaust Memorial & Museum. We visited the “Valley of the Communities” where we heard Shlomo share about the dozen family members he lost from Vilna, Poland. We also walked through the Children’s Memorial and museum. On our way back to the hotel, we made a brief stop at the Israel Museum. Here we saw a 1:50 scale replica of 1stCentury Jerusalem. We also saw some of the “highlight” artifacts in the archaeological wing of the museum. We returned to the hotel for dinner and another optional walk (this time to Ben Yehuda). This is the last day of the Israel portion of the tour. Magnificent blue skies and perfect temperatures greeted us as we left the hotel for the Garden Tomb. We would be the only group there. We enjoyed a tour around the grounds before visiting the tomb itself. We shared a brief worship & communion service together. Leaving the Garden Tomb, our next destination was the City of David. Here we saw a brief 3-D movie before touring the excavations. We alluded the stories from 2 Samuel 5, 2 Kings 20, and 2 Chronicles 32 about David, Hezekiah, and the Assyrians. We continued through Warren’s Shaft before descending all the way to the Gihon Spring and the impressive tower that guarded Jerusalem’s water source! It was from here where we entered the waters of Hezekiah’s Tunnel, a 1,720 foot tunnel that brought water into the city. It ends at the Pool of Siloam where we heard the story from John 9. Most of us then climbed back to the SW corner of the Temple Mount through a recently-excavated “drainage channel” built by Herod. We saw the stones that served as the foundation of the Temple itself! Once we ascended to the Roman street, we saw Robinson’s Arch and many Herodian stones that fell in 70 AD. We ended the tour of this “south-wall excavations” by climbing the very Temple steps. Many stories pertaining to the Temple were shared (Luke 2, John 10, Luke 18, Mark 12 & 13, and Acts 2). The rest of the afternoon as free. Some returned to the hotel while others explored the Old City more. The visibility to the east was amazing! We could see the hills of Moab and Mt. Nebo from here! returned to the hotel where we loaded our luggage and drove to our farewell dinner nearby. Following a great dinner, those not going to Jordan drove to the Ben Gurion Airport for the flight home. What a great Israel trip this was! This morning the nine of us loaded our mini-bus at 7:30 and headed for the Allenby Bridge crossing into Jordan. Although we were slowed a little in the process of crossing into Jordan, we made it to the Jordanian side without issues. There we were greeted by “Mo” our guide, and Abdullah, our driver. After processing the passports (about 10:30 a.m.), we drove to our first stop of the day, Mt. Nebo. It is a mountain that stands about 2,700 feet above sea level. Although the visibility was very limited because of the haze in the Jordan Valley below, we could picture Moses here. We read from Deuteronomy 34 and Joshua 1 about Moses’ death here, and the crossing into the Promise Land. On our way to Medeba, we stopped briefly at a mosaic school. Young disabled Jordanians are taught the art of mosaics. We continued from here to St. George’s Church where the 6thcentury AD Medeba map is displayed. Because the road to Macheraus (where John the Baptist was beheaded) as closed (due to the washed-out road from ast week’s snow/floods), we headed to Petra. Driving through ancient Moab, we read from Judges 3 (Ehud vs. Eglon) and Numbers 22 (Balak, Balaam, and the talking donkey). Turning off the “Desert Highway” we visited Shoubak, a Crusader Castle. We enjoyed some tea and coffee served to us by a Bedouin man. The sunset was very nice too. We arrived in Petra (Wadi Musa) for dinner. We retired early in anticipation of a long day tomorrow in the site of Petra. What a great day it was! The sun was out in brilliant form here in Petra, with perfect temperatures! We would spend almost 8 hours in the site. After a great breakfast, we left the hotel at 7:45 and walked to the entrance of this “red-rose city.” Mo led the walk through the “Siq” (canyon). It led right to the magnificent Treasury (can anyone say “Indiana Jones?”). This is the most famous tomb of Petra, one of over 600+ tombs. Petra was the home of the ancient Nabataeans. The city covered 65 square miles. Everywhere we walked we saw evidence of their presence here. Their focus in life was on the after-life more than anything as displayed by how magnificent their tombs were. From the Treasure we walked to the Roman theater, past the Urn Tomb (and hundreds of others). There is simply so much to see here! One of our optional walks was to the Monastery, a monumental tomb located on the western edge of Petra. All of us hiked the 850+ steps up. This was an extra 4 mile hike out and back. From the highest point overlooking the Monastery we could look westward into the eastern Negev of Israel. From here e hiked down to the Roman street and back the same way. Three took up this challenge of another optional hike that ascended up to the High Place. We thought for sure that a Bedouin was going to take his donkey off the cliff! Thank goodness, he didn’t. From here we could see a majority of the site of Petra. We all returned in the mid-afternoon to our hotel. Loading our mini-bus, we drove back north to Amman where we had a chance to eat dinner and freshen up a bit before our night flight home. We arrived home from Amman, Jordan via Paris, France. The nine of us really enjoyed Jordan. What a blessed trip in every way!